The beautiful turquoise waters surrounding the Seychelles is a scuba divers’ dream. This archipelago of 115 islands offers a diverse topography including reefs, coral walls, pinnacles and canyons. 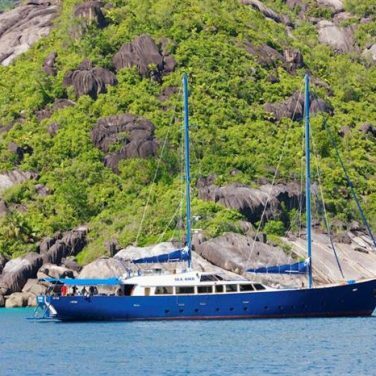 Joining a Seychelles liveaboard boat gives scuba divers the chance to thoroughly enjoy the underwater landscape and the exciting marine life in the area. The beautiful white sandy stretches of beaches on the islands set the scene for a tropical diving holiday, as well as unique flora and fauna on the islands. 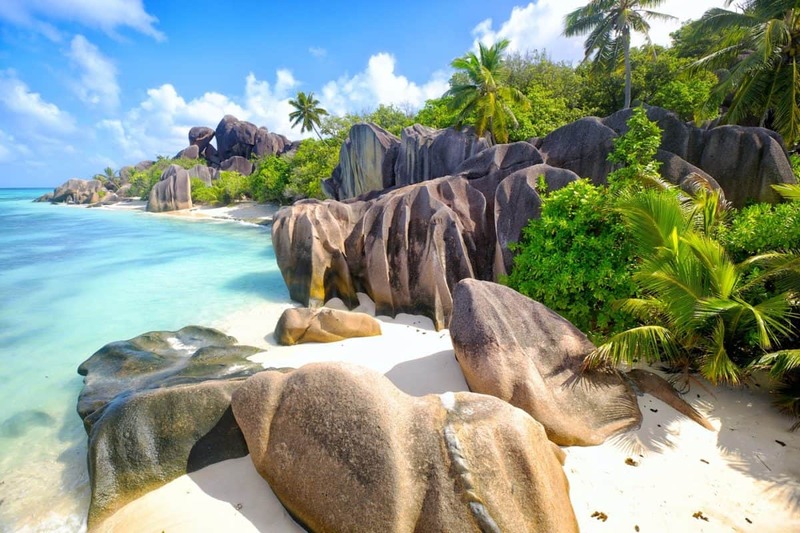 The Seychelles have two UNESCO World Heritage Sites, including the world’s largest raised coral atoll, Aldabra. With such beautiful diversity on land and underwater, it can be hard to choose the right liveaboard. 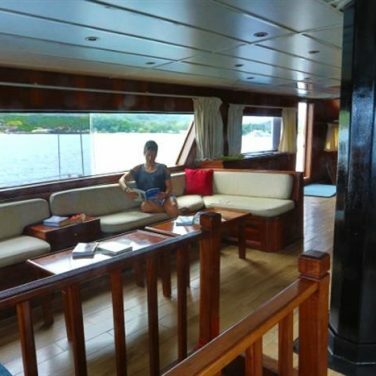 So, we’ve put together the best Seychelles liveaboards for you to consider and a guide to determining which one is best for you. 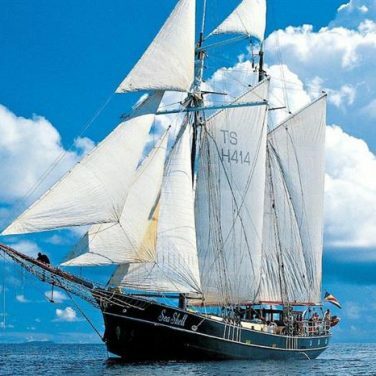 The sister vessel to the Sea Pearl, the Sea Shell is a historic sailing schooner, updated for diving and island hopping. 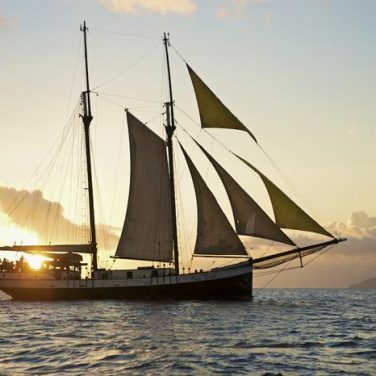 Her one-week itineraries around the northern islands are perfect for families, and groups with non-divers thanks to a variety of daily activities. Guests can expect snorkeling, kayaking, shore excursions, and evening beach BBQ’s. Less intrepid clients can spend their days on the sun deck relaxing and watching the world go by. Unlike anywhere else on earth, the Seychelles archipelago is a dream destination for underwater naturalists. And, the Sea Bird visits all the region’s highlights. Guests can expect to visit the most exciting dive sites around the islands, as well as bird sanctuaries and a nature reserve dedicated to giant tortoises. Charging points and dedicated rinse for underwater cameras make this a great choice for photographers, too. Liveaboard divers looking to capture their most exciting moments underwater can make the most of their trip aboard the Sea Star. 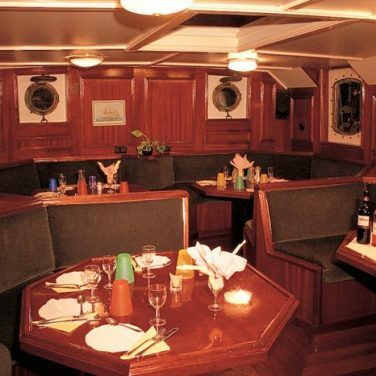 This boat visits all the best diving areas around the Seychelles, and plenty of exciting above water attractions, as well. Onboard amenities like SUP and kayaks add extra opportunities for avid photographers. And, special facilities for underwater cameras making caring for equipment a breeze. 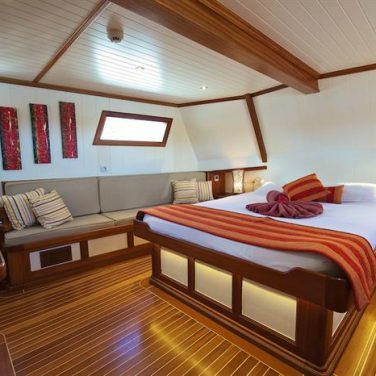 While visiting the Seychelles is an incredible opportunity, the Galatea takes its itineraries to the next level by combining world-class diving with a touch of luxury. 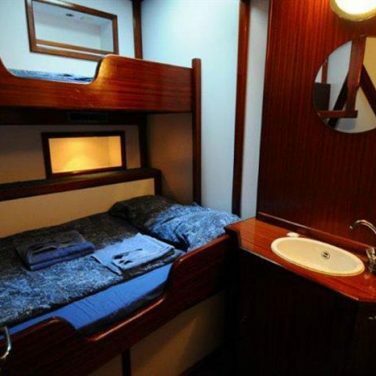 Spacious cabins, fine dining, and an extensive wine list are just a few of the amenities guests can expect onboard. 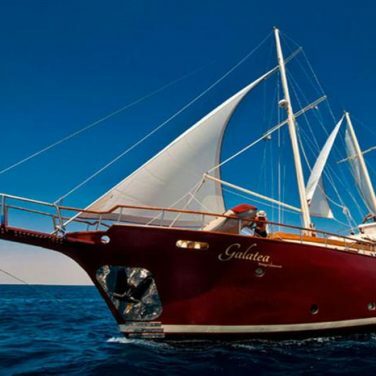 The Galatea is the only boat in the region that offers private guiding services, deep sea fishing, and even yoga on the top deck. Best of all, with only 14 divers onboard, you can expect plenty of personal attention both above and below the waves. 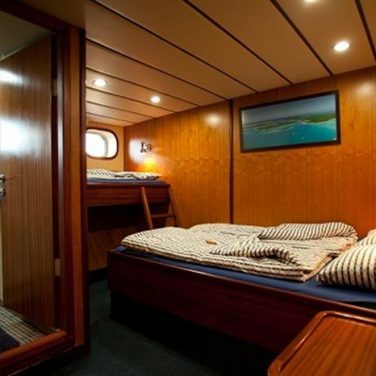 If you’re planning a liveaboard dive trip in the Seychelles, but you don’t have a ton of time, the Sea Pearl’s shortened itineraries around the northern reaches of the archipelago are a great fit. You’ll visit fewer islands, but spend more time at each one. And, the trip still stops at some of the best dive sites in the region. These voyages are perfect for newly certified divers, weekend warriors, and families with kids, too. Beginner. Traditional itineraries around the inner Seychelles are best for Open Water divers, with only one or two difficult dives. Most boats offer courses onboard, starting with Discover Scuba. But, Advanced Open Water and specialties like underwater photography are the most popular picks. This region is good for snorkelers too, thanks to calm conditions and plenty to see from the surface. 7 to 9 days. 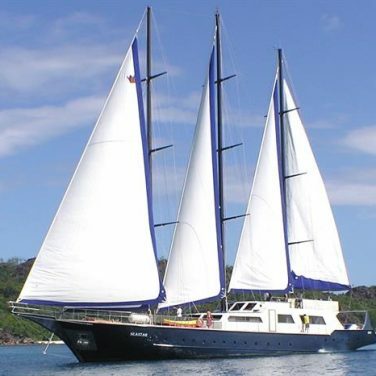 Some of the most exciting parts of a liveaboard around this archipelago are the shore excursions. So, to make the most of your time in the Seychelles, you should visit as many islands as possible. 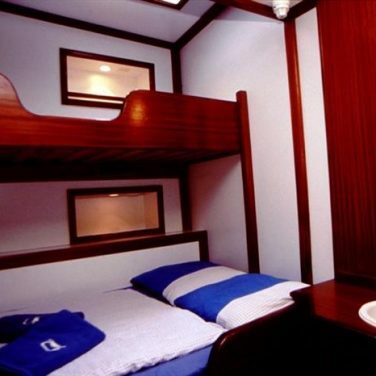 A few options for shortened itineraries exist here. But, thanks to the size of the region, you need at least 7 days to take it all in. The Seychelles are a year-round dive destination. And, when it’s best to visit depends on your goals for the trip. Between March and May, the seas are at their calmest and visibility peaks. But, fall months are best for spotting whale sharks and mantas. Weather in the Seychelles is warm and tropical all year. Though, the monsoon months of July and August are the coolest and windiest. Ocean temperatures change little throughout the year, varying from 78 to 84° F (26-29° C). A shortie should be plenty of exposure protection, but bring a full suit if you’re planning 3 or more dives per day. Visibility in the Seychelles is generally excellent, stretching from 65 to 98 feet (20 to 30 meters). Between June and October, rough surface conditions and blooming plankton reduce water clarity. But, these are the best times of year to spot feeding whale sharks and manta rays. Unlike other destinations in the Indian Ocean, the Seychelles aren’t famous for their coral. Instead, these islands feature granite reefs, found nowhere else in the world. The main attraction it this region is marine megafauna. Whale sharks, mantas, and even hammerheads call these waters home. Calm conditions, unique backdrops, and plenty of big fish make the Seychelles a great choice for new underwater photographers looking to hone their skills. 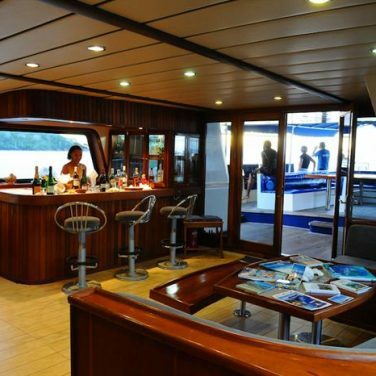 Most liveaboards cruise the inner Seychelles, making them best suited for newly certified divers. And, the majority of itineraries focus on snorkeling, kayaking, and shore excursions as much as they do diving. So, if you’re taking a trip with non-divers or kids in the group, this might be your dream destination. If you are planning your very first liveaboard dive trip or hoping to get scuba certified while on vacation, this region offers itineraries perfect for you. Most boats teach courses for beginners and cater to divers with an introductory skill level. 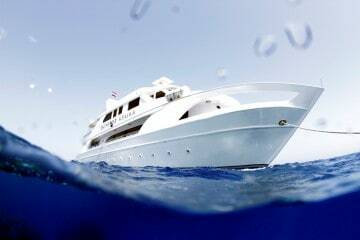 Flexible voyages make it easy to complete 1 or 2 dives a day if you prefer a mix of activities or extra time to relax. The Seychelles islands are one of the best places in the Indian Ocean to encounter whale sharks. During fall months, the sharks gather here in great numbers to feed on plankton in the shallows. Your best chances of spotting the biggest fish in the sea are from the surface, where cruise slowly with their mouths open, filtering for food. Just like the whale sharks, manta rays pass through the Seychelles in search of food. You’ll most likely spot these graceful ocean giants resting on reeftop cleaning stations waiting for a scrub down. But, cyclone feeding is observed here, too. If you’re visiting between June and October, keep a close watch out in the blue, as you never know when one might glide past! Hammerhead sightings increase around the Seychelles during two peak seasons. And, if you’re visiting between March and May or September and November, you might just spot one. If you’re hoping to come face to face with these shy and elusive predators, early morning dives around Shark Bank offer your best chances. Whether you’re hoping to take your first breaths underwater, get open water certified, or continue your dive education, this region’s calm waters make an excellent classroom. 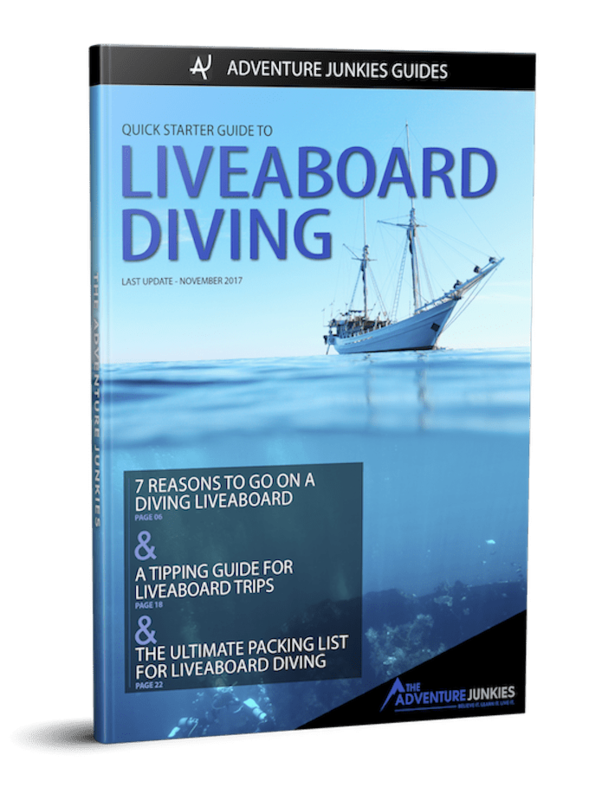 Be sure to contact your liveaboard operator in advance to make these arrangements. And, come prepared to learn. Most courses take 3 to 5 days to complete. 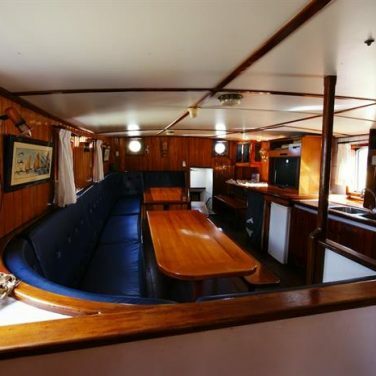 Though the region has over 100 islands, most liveaboards visit only a few in the archipelago’s interior. There, divers will encounter endless schools of colorful reef fish, and plenty of large pelagics, too. Because they are protected from the open ocean, these dive sites offer calm conditions as well, making them perfect for divers of all skill levels. Best of all, you don’t have to leave the central islands to spot the region’s most impressive wildlife like whale sharks, manta rays, and hammerheads. Most itineraries around the Seychelles last just over a week, stopping at the region’s best dive sites in Mahé, Silhouette Island, La Digue, and more. 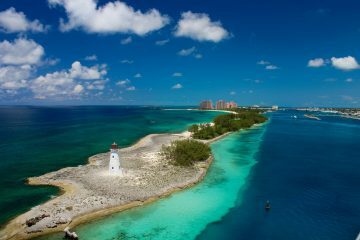 These trips typically combine diving with a variety of other activities like kayaking, hiking, and snorkeling. Unlike other destinations in the Indian Ocean, you can expect 1 or 2 tanks a day here. 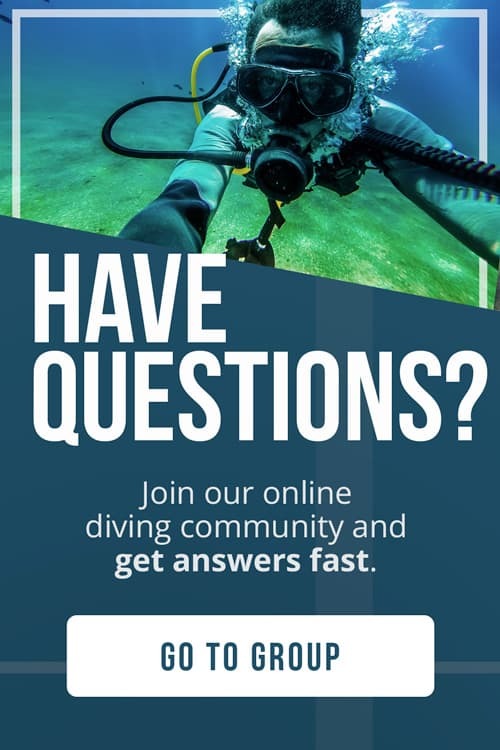 If you’re looking to log the most dives possible, it’s always an option to add more on. But, don’t miss out on the excellent shore excursions in this area. Fascinating wildlife, charming locals, and some of the planet’s best beaches are all part of the package. If you can’t get away for quite that long, don’t worry! 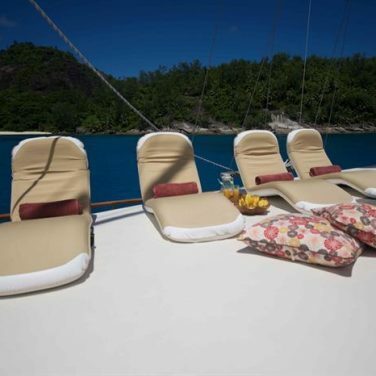 Some boats offer shortened itineraries that visit many excellent dive sites around the Seychelles in only 6 days. You might miss out on Mahé, but you’ll still have plenty of opportunities to dive and snorkel the region’s unique granite reefs. These trips include around 10 tanks, and plenty of shore excursions, too. If you are planning to complete a dive course while on vacation, keep in mind that you’ll need to make a 3 to 5 day commitment. This includes training sessions, practice dives, and study time. Many divers visit the Seychelles in hopes of swimming alongside its most famous residents, whale sharks. Your best chances are during fall months, as they gather around Mahé to feed. During the rest of the year, you’ll encounter massive schools of angelfish, butterflyfish, and batfish. Reef sharks and hawksbill turtles cruise the reeftop, and the occasional hammerhead patrols out in the blue. Thanks to warm temperatures and calm currents, the conditions around Mahé are perfect for newly certified divers and snorkelers. Most liveaboards visit the island’s northwestern coast thanks to its unique mix of granite and coral reefs, protected coves, and stunning beaches. While there are plenty of great places to dive around Silhouette Island, most liveaboards opt to visit Shark Bank. This submerged site is best for advanced divers thanks to its depth and, at times, powerful currents. Perfect for drift diving and underwater photography, this massive seamount is definitely one of the most exciting spots in the region. Large shoals of barracuda, snapper, and batfish are ever present. Reef, leopard, and nurse sharks, manta and eagle rays, and whale sharks make appearances too. Just north of Silhouette Island, North Island is home to some of the healthiest coral in the Seychelles. A series of encrusted pinnacles rise to the surface from the sandy bottom, serving as cleaning stations. There is plenty to see at a variety of depths, making this a great dive site for all skill levels. Northeast of Mahé, La Digue is a “must see” addition to any liveaboard itinerary in the area. While the island isn’t known for its coral, there is still plenty to see on the reef. Comprised of granite boulders, dive sites around La Digue are full of fascinating swim-throughs, caverns, and even caves. Colorful soft coral adds a splash of color and creates a habitat perfect for juvenile reef fish and macro life. Sharks, rays, and turtles, can be seen here as well. Just remember to keep an eye out in the blue! No visit to La Digue is complete without a stroll on the pink sands of Anse Source d’Argent beach. 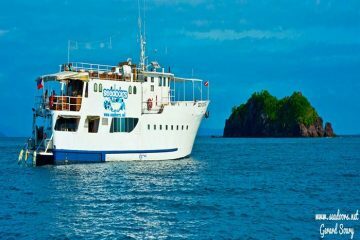 This is a guaranteed shore excursion for most liveaboards, and well worth your time out of the water. Most Seychelles liveaboards stop at Petite Soeur (Little Sister) for a dive en route to the privately owned Grande Soeur (Big Sister) for hiking and an evening beach BBQ. The most common choice in this area is a drift dive at Sister Bank, a granite boulder field famous for caverns and swim-throughs. Schooling bumphead parrotfish and patrolling reef sharks are common during early morning immersions. Other, more rare finds at this site include Armitage angelfish, clown triggerfish, and all kinds of cool macro critters. Some boats stop at nearby Coco Island, whose protected cove creates a natural aquarium, for snorkeling. Home to the biggest coconut in the world, the Coco de Mer; and a variety of unique wildlife, Praslin is a popular stop for shore excursions. But, there are plenty of attractions underwater, as well. Shallow dive sites reveal a healthy mix of granite and coral, teeming with life. Pipefish, nudibranchs, and a multitude of colorful fish inhabit cracks and crevices while reef sharks, eagle rays, and turtles glide by in the blue. 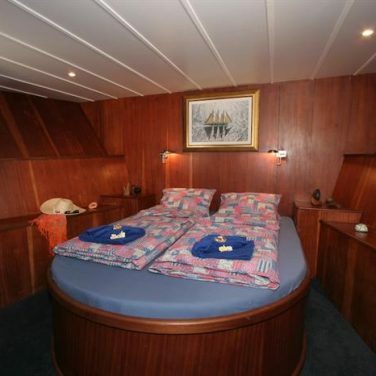 Most liveaboards anchor here overnight, making for a convenient dive after dark. Turtle lovers should choose an itinerary that makes an extra stop at nearby Cousin Island, an important nesting site for hawksbills. Surface conditions are unpredictable around this island but don’t let a few waves scare you off. What lies beneath is well worth it! A dedicated marine park since 1979, Curieuse is one of the best-protected islands in this region. And, liveaboard operators know it. You can expect to stick around for more than one tank in these pristine waters. Bumphead parrotfish, giant shoals of snapper, migrating mantas, and the occasional reef shark make for excellent day dives here. But, the park is equally impressive after dark. Sea hares, Spanish dancers, several species of octopus, and sleeping turtles dot the reef. The waters around Curieuse are calm enough for divers of all skill levels, and snorkelers will find plenty to see in the shallows here, too. If you plan your visit between June and October, you might get lucky and spot a whale feeding on the surface!